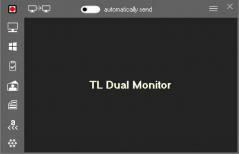 TL Dual Monitor is a practical application that lets you display your desktop, text and images contained in a window or a certain application’s window on a secondary monitor. The program consists of two windows. One enables you to configure the app, while the other can be sent to another display on which you want to view the content on. You can send your entire desktop or just a certain region, specific application windows, files, photos and scrolling text. The content can be transmitted automatically by TL Dual Monitor, but you can also manually control the operation. The program even has an included slideshow creator that lets you display entire photos albums on a secondary display. On top of that, it bundles a basic text editor which enables you to edit the behavior of the scrolling text shown at the top or bottom of the screen.